I have noticed a lot of recent interest in the TED Commandments, the list of rules every Technology/Entertainment/Design conference presenter receives (chiseled somewhat melodramatically in stone) that reinforce the high bar for which TED talks are known. Let me preface this post by admitting that I am a consummate fan of TED, which I think of principally as a non-profit institution that has developed a remarkable cross-disciplinary and cross-cultural digital knowledge sharing model. In this sense TED is a phenomenal manifestation of new media: what began as a small-scale technology conference has morphed into an institution that provides a uniquely logical antithesis to random YouTube spelunking: using the power of cultural cache, intelligent social marketing, free digital distribution, and strategic technology development, TED has gone about spreading its series of worthwhile ideas with relentless success. In the past week I had two TED-related conversations, one with Ben Wurgaft and the other with Lia Friedman, both of whom offered extremely insightful and interesting commentary on the socioeconomic implications of the talks/presenters that I hope they will share here or elsewhere. My focus comes from another angle: to examine the format and context of the TED commandments, and consider their implications for interpretation and application by the speaking and teaching (ahem) laity. The TED presentation model is highly rhetorical, as in based in the skillful delivery of one-sided, sage/stage performances meant to educate, persuade, and entertain. Thus, in the spirit of rhetoric’s counterpart (dialectic), I thought I would turn a critical eye towards the TED model itself. While suited to its context, the TED model to some degree discourages presenters from engaging questions or inviting audience perspectives mid-stream – digital commentary and I imagine formal conference Q/A occur only after the talk’s conclusion (and Q/A is sadly never included in the videos themselves). Despite the commandment that explicitly prohibits “selling from the stage,” most TED talks combine dynamically communicated, expressly authoritative, and highly evangelical expertise in order to make a successful pitch. Evangelism is the communication of profound beliefs of which one is compelled by calling to convince others, while a pitch is meant to raise anything from capital to awareness in order to forward a venture or approach. Pitches don’t necessarily have to sell, but evangelism definitely has to convert. I am fascinated by the creation of a digital space in which the nerd cache of the Steve Jobs variety is so successfully replicated, time and again, through this type of pitched evangelism. TED presenters span an incredible range of occupations and subfields, from the most successful politicians imaginable to a surprising number of math teachers, and I am personally curious about how TED speakers are selected (as in, who decides which ideas are “worth spreading”?) The modus operandi seems to be to identify highly successful, entrepreneurial, and charismatic experts doing interesting work in culturally relevant and changing subfields, provided that said work is neither particularly polarizing nor conservative. The commandments are all excellent (if not relatively self-evident) pieces of public speaking advice, to be sure. That said, a few revelations about the commandments come in their contextualization: I have never watched a TED talk that was not given by someone who was a) already highly famous, and/or b) an obviously expert public speaker or performer in their own right. To my eye, the commandments are therefore less pitched to remind presenters that they need to be dynamic and interesting than to necessarily reinforce the TED formula. Which is not to say that this formula is negative, by any means: it has much to do with encouraging presenters to reveal the core enthusiasm and motivating interest behind their particular sub-genre of nerddom, so often tamped down as pollyannish in typical academic and political arenas. Use your earnestness and personality to communicate the enthusiasm you feel for the subject of your own expertise in order to engage and educate your audience. If taken at face value, the TED commandments encourage us to be engaging and accessible and refer to other presenters or the sake of controversy, but they also remind us to please not run on or invite chaos by engaging our audiences directly in a way that might interrupt our flow. Which brings me to the motivation for this post: from the one-the-ground speaker and educator’s perspective, the commandments need a few important amendments. While excellent advice for structuring dynamic and comprehensible mini-lectures, they leave out a cardinal rule of public speaking and teaching in more “normal” circumstances: interactivity. I have already mentioned the number of good reasons for this, but when discussing public speaking and the TED commandments it is important for the rest of us to remember that the TED commandments spring from a very particular, highly privileged, and strategically hyped venue. While one can be critical of format and scale of TED talks, they are perfectly suited to their context: highly scripted and painstakingly crafted to be succinct, witty, and dense encapsulations of some of the most complex, arcane, and technical concepts imaginable. What I particularly like about TED is that it is a showcase of individuals so incredibly, contagiously engrossed in their own work, so dedicated to a particular idea, approach, or belief, that they have devoted themselves to forwarding it. It is an almost hilariously rockstarred version of professionalization, and a perfectly Americanized, lights-(digital)camera-action manifestation of the public intellectual. It is in large part the authority and cache of the institution that makes TED talks effective – by virtue of their being invited to deliver a TED talk, the audience is already positively disposed towards the presenter, and primed for a fascinating, etc. spectator experience. Most of us who present, teach, and/or train are not going to be met with the same sort of ultra-anticipated exuberance as TED speakers. 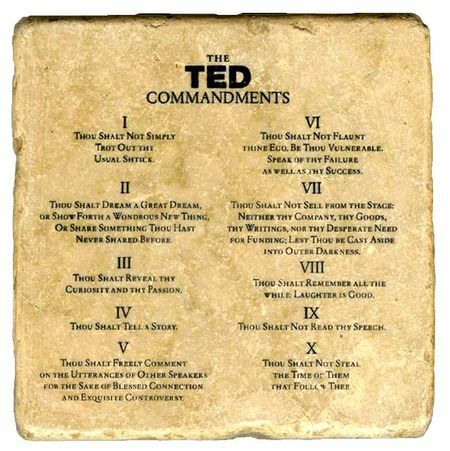 It is, therefore, not necessarily the TED Commandments per se that we should be following. It is the cultivation of the intrinsically motivating, contagious sense of enthusiasm that can captivate any audience combined with an awareness that, without TED-esque mystique and marketing juggernaut behind you, you’re going to have to be far more interactive in order to engage people. With enough evangelical expertise and authentic interaction, literally anything can become interesting for 18 minutes. This, I think, is the real secret of effective public communication. 1) Do not assume that thy expertise or bio precedes thee, lest it be incorrectly interpreted as arrogance or lack of adequate preparation. 2) Interact bravely and often with thy audience, so that thy content is more readily pitched towards their interests and knowledge. sweet (anxiety) dreams: a convo with momma stillwell. Totally agree that nothing helps a presentation succeed more than the speaker’s enthusiasm for the topic. I really believe that to most people the finer points of database navigation are just plain boring, but somebody talking about truncation who really loves what it can do? Whole nother story. And if you missed this Salon column by the yes men about their TED experience, it’s worth checking out. Char, as always you’re wonderfully insightful and your prose is a model of clarity. I think there’s much more that we could say about TED and that there’s at least one full-length essay waiting in this block of marble to be chipped away. Your analysis of the religious (“evangelical”) structure of the TED talks seems spot on, and in conversation you made the apt observation that their the heirs of a long American tradition of technological expertise-evangelism. We might do well to develop that point further. For example, is the tendency to shy away from politically divisive issues or technologies, something for which we find precedent in US techno-evangelical history? Are all TED faith-messages of the same ilk? I rather think not. When a regenerative medicine doctor tells us about his techniques for regrowing limbs and organs its different from Jane McGonigal asking us to play games and get our kids to play games, and believe in games as a world-changing medium. I loved your question about how expertise is selected for in the TED world – and what constitutes expertise. Certainly, expertise is here “proven” by the attainment of some type of fame. As Phil Tetlock at Haas likes to point out, fame is actually one of the few things that can be found to serve as a predictor of the reliability of experts – but it’s a negative predictor, amusingly enough. The term “public intellectual” as you might guess fascinates me – it was coined or popularized by C. Wright Mills in 1953 in the U.S., and for some commentators its oxymoronic b/c “intellectual” is a term that already presupposes the existence of a public. What strikes me as radically different about TED PI’s, is that unlike “traditional” PI’s, they’re not critics or observers (usually) but rather innovators, makers, builders. We might well ask if this isn’t a very different model of public intellectual life! ben, excellent point (per usual) about the maker/builder character of the TED PI: substituting ‘innovator’ for ‘intellectual’ seems significant indeed, and quite in keeping with the m.o. of our mutually adoptive home (i.e., california).